Electricals retailer AO.com named Best UK Retailer by the public at GlobalData’s 2017 Customer Satisfaction Awards. • Waitrose’s 12-year run as best food retailer has ended, having dropped third position. Marks & Spencer takes its crown, followed by discount retailer Aldi. 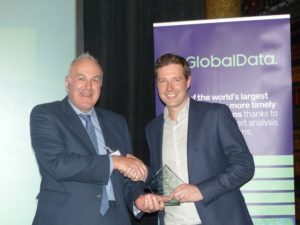 AO.com, John Lewis and Marks & Spencer dominated proceedings at GlobalData’s 2017 Customer Satisfaction Awards, held on 27 April at The Royal Horseguards Hotel, London. Sponsors included global textile group Indo Count Industries; Lithium, which delivers digital customer experiences; and Qmatic, the global leader in customer journey management solutions. This year AO.com continued its winning streak, securing the award for overall best retailer for the third consecutive year. AO.com has continued to invest in its customer service capability by launching its ‘track my order’ app, as well as increasing brand awareness through its summer 2016 next day delivery marketing campaign. AO.com also diversified its proposition this year by entering the computers & tablets market, which will help the retailer appeal to a broader customer base. Disappointingly for Waitrose, its 12-year streak as best food retailer has ended with the grocer falling two positions into third place, while both Marks & Spencer and Aldi moved up one position to take first and second place respectively. The absence of all of the big four retailers in the top three marks the polarisation of the grocery sector, with consumers choosing to treat themselves occasionally at premium supermarkets, and trade down to discounters such as Aldi and Lidl for everyday value. Marks & Spencer took home two online awards at GlobalData’s Customer Satisfaction Awards, having been voted the best click & collect retailer and overall best online retailer – leaving online heavyweight Amazon in second. However, Amazon received the award for best online fulfilment, with Marks & Spencer and New Look in second and third positions respectively. The GlobalData Customer Satisfaction Awards are determined by the results of our detailed consumer research for this series only. GlobalData analyst opinions do not impact the judging process. For the complete methodology, see below. GlobalData’s Customer Satisfaction Awards measure how satisfied customers are with the retailers they use. It is the result of two consumer surveys: one based on an online survey of 10,000 consumers that examines shopping habits across all channels; and one based on an online survey of 10,000 consumers that looks specifically at online retail. The overall retail survey covers 10 core retail sectors, as well as an overall and in-store satisfaction award, and measures satisfaction based on consumers’ recommendations. For example, we ask how likely customers are to recommend a retailer where they have shopped to a friend or colleague, and request a rating between 1–10, 10 being very likely. The culmination of all responses allows us to calculate an overall satisfaction score. In the online survey, which produces the Best Online, Best Fulfilment, Best Online Experience, and Best Click & Collect awards, shoppers are asked where they made their last online purchase and how satisfied they were with the purchase across six areas. The retailer with the highest average rating is considered to have the most satisfied customers. The GlobalData Customer Satisfaction Awards are determined by the results of our detailed consumer research for this series only. Only the opinions of those who shop at the stores have any influence on the results. GlobalData analyst opinions do not impact the judging process. Indo Count is a vertically integrated Indian bed linen manufacturer, employing over 3,000 people, manufacturing sheeting, yarn dyes, prints, embroideries, bedspreads and mattress protectors. With design studios and showrooms in the US, UK, Australia and India, Indo Count is recognised for its fabrics and innovation. Ranked 11th largest supplier into the US across home textiles, with a market cap of £500m sterling, we are also established as one of the largest sheeting suppliers into the UK, where growth is set to continue in line with increasing demand for better qualities. Lithium delivers brilliant digital customer experiences at scale. Over 400 global brands leverage the Lithium Engagement Platform to connect customers, content and conversations at the right moment across all digital touchpoints. Qmatic is the global leader in customer journey management technology solutions and insight. We help organisations to integrate online and onsite engagements. The result is experiences that improve business, support employees, and delight customers, patients and citizens. We are committed to Keeping the World in Go!